While I am recovering from a flu, almost 50 people from the Houston Chowhounds list are recovering from a taco truck crawl. 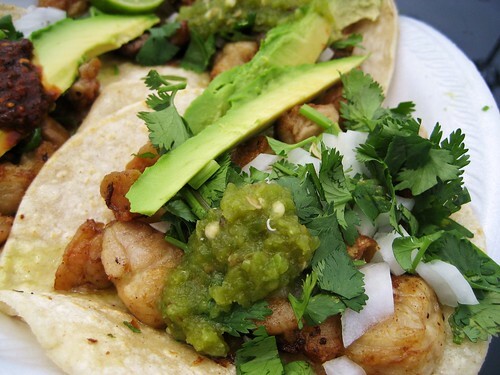 Their first stop is my favorite eat spot in Houston – the Tacambaro truck behind Canino Produce. Robb Walsh first wrote about Tacambaro in his excellent article about taco trucks in Houston (I hoped for a regular taco truck feature in the Press, but it hasn’t happened yet). I’ve been making regular trips to Tacambaro ever since and every time walk away convinced that this Mexican preparation of sweetbreads is superior to the French. The French version of sweetbreads is quite pre-processed – the glands are cleaned, soaked, poached, pressed and peeled, before being dredged in flour and sautéed. The Mexican version seems a lot simpler. The taco lady simply peels off enough meat to make a taco from a big bag full of poached sweetbreads, then throws them on the griddle and pan fries in some mysterious grease. The sweetbreads come apart in all the right places along the membrane lines and eventually look like broken down cauliflower florets, each individually fried until they have a perfect ratio of crispy surface to creamy interior. Combined with a salsa verde, a few chopped onions, cilantro and an avocado wedge, these tacos are far better than any French sweetbread dish I have ever tried. Order it with a Mexican Coke in a glass bottle, if you want to get the complete experience. More images from Canino’s Produce and Taqueria Tacambaro.